my first sweater. At the time I was getting ready to start this, I got the flu the second time, but I was able to learn the knitted cast on (which is the recommended cast-on for this project). I tried the technique using the instructions from Cast On, Bind off. I posted about this craft book here. completing a swatch of my (new) surprise technique. My goal really was to learn another technique, but I figured Tunisian crochet is as good as any to learn. 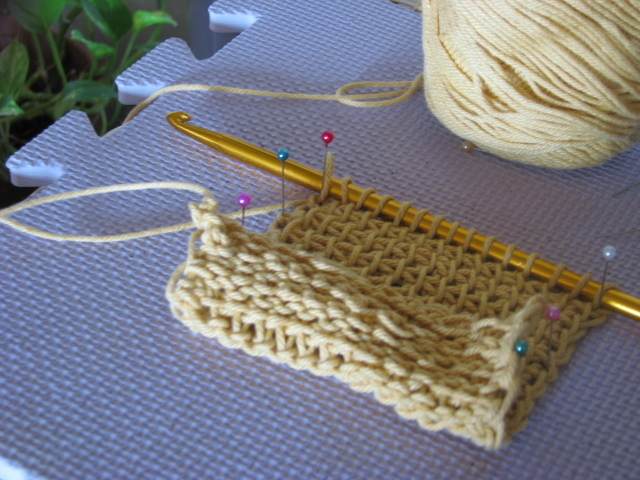 To get started with TSS (Tunisian Simple Stitch) I used my Robyn Chachula book –Crochet Stitches Visual Encyclopedia for the instructions and for a clearer tutorial, this one from Mary at Crocheting The Day Away. It was really so exciting to see the fabric form. The fabric works up really fast but I have to work on my tension. Despite the range of tension in that one swatch, I’m as pleased as punch that I got the fabric looks the way it’s supposed to look on the front side. The tension issues are even more obvious on the backside of the fabric. 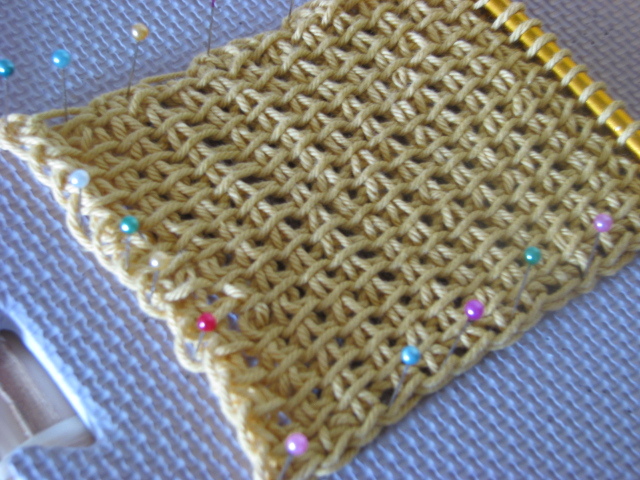 It’s supposed to resemble knit garter stitching; you could actually see it where my tension was good. I also have to work on neatening the left edge when I do the Return pass (working from left to right). The recommendation is that a person sizes up two hook sizes to help keep the loops open enough so you wouldn’t have to struggle with the stitches but I think I went up three. I pretty much just grabbed a hook and went at it; that’s so unlike my careful planning to death style. 😀 I think sizing up correctly should help with my tension in addition to just practicing. Awesomesauce!!!! Despite all that, I can say that I know what I need to do where the technique is concerned — including correcting mistakes. On to another swatch then onto my first Tunisian project!!!! So all together, this month wasn’t a total wash. Hope you each had a great crafting month. I was really surprised at the garter stitch look alike at the back of the swatch! You should totally try it. The simple stitch was easier than I thought.